Today, not many photos, the big thing today…The Anne Frank House. ACS, EJS and I walked over to dad and LaLa’s hotel for breakfast then to was a short detour while ACS went back to the hotel for something. Eventually we made our way to the Anne Frank House. This is a place you definitely need a ticket for and it was the first thing LaLa got before our trip, they really recommend getting tickets a few months in advance and they were right! What a sobering experience. There is no furniture in the house, just photos and explanations of who and what. You saw the people they lived with, the few rooms they had, the door with the bookcase that hid the entrance to their hiding place, this is what EJS found most interesting about the house. The stairways were narrow, the floors creaked and you really got a sense of just what it could have been like and how you might have tried to imagine if you could have handled it. The windows were covered, just think about it, you can’t speak, make a sound, look out of a window for two years. There were a few messages of hope throughout the house. In her room, you could see the photos of movie stars and cutouts from magazines that she had taped to the walls, to give her a little normalcy in what only could have been an insane situation. Her father is the one to publish her diary and after reading it, discovering her true feelings about and things, says something very telling that I’m sure many people feel about their children, we don’t truly know them. One of the things I remember ACS saying when he went the first time was how difficult it was for him as the father of a young girl. I can totally understand that statement as I am sure so many of us do. The statement that impacted me most was something Emma Thompson said in a speech at the Anne Frank House in 2006: The only thing we have to remember is: all her would-haves are our real possibilities. All her would-haves are our opportunities. And the book’s a flame, a torch, we can light our own candles and take them and illuminate our hearts with the incandescence of her spirit. 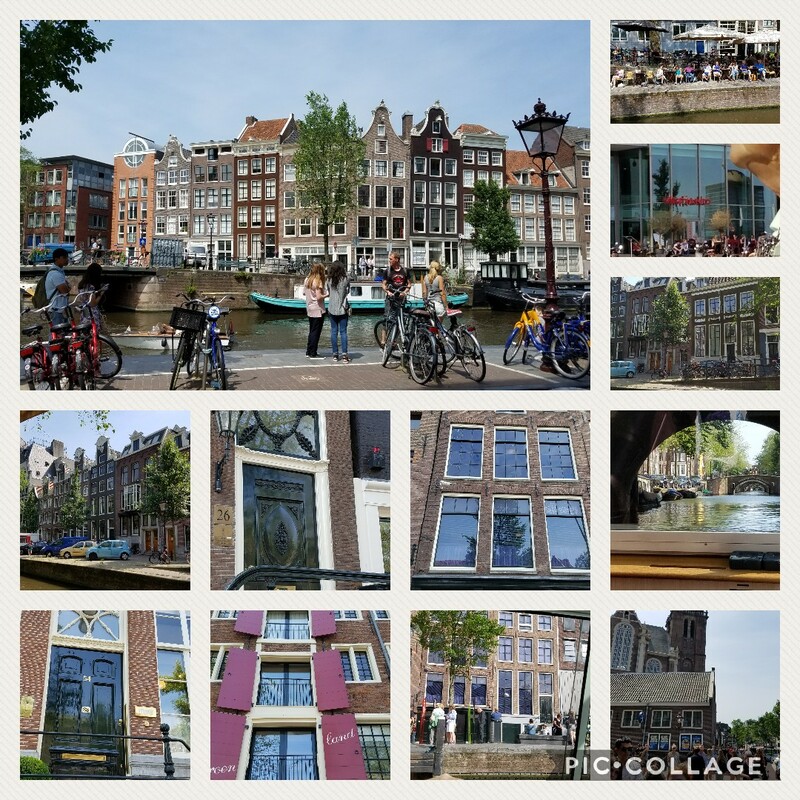 After the Anne Frank House, we went to lunch on a canal, go figure! We had so much to discuss. We walked after that, back to Central Station where we took a canal cruise, not as good as the one the other day, but we learned a few things. Then it was on to dinner at a fantastic Thai restaurant near the apartment, a stroll back to the hotel for dad and LaLa, apartment for the rest of us. What does tomorrow hold? I can’t wait to find out! The weather was perfect! We had one thunderstorm that lasted about 45 minutes, that was it! I’m so pleased, that means it was all worth it!